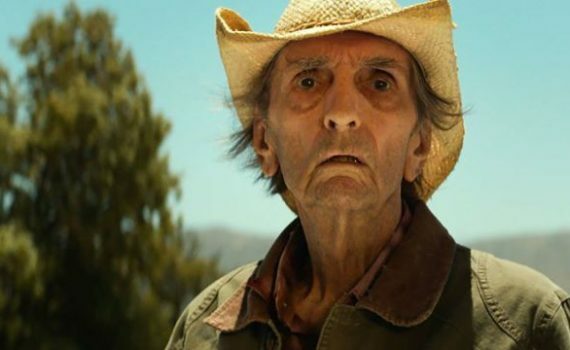 Harry Dean Stanton died two weeks before Lucky was released; a fitting end to a project about the imperfections of life and the annoyances of dying. Stanton was 90 playing a man who was 90, looking at his own timeline as he shared that feeling with audiences, the knowledge that the end is near not because you’re close to death but because of its inexorable ability to wait for you to come. We’re all of us almost dead, and at the same time full of life, a fact not lost on this film. John Carroll Lynch might be a first-time director, but he’s been around the block as a character actor, and he apparently knows when to let the source material and the lead actor do their jobs and do them well, allowing the stirring story to be laid bare at our feet, our only task being to decide what to do with it. Lucky doesn’t seem to match his nickname, given him when he was in the Navy, but he makes do with it the best he can, playing the role of the crotchety old man while also able to see life for the fortunate wonder it is. He wakes up every morning with a cigarette, does his yoga, drinks his coffee, goes on his walk, has his breakfast at the diner, watches his game shows, heads over to the local bar, and attempts to appreciate the details as much as he can, from pet tortoises to mariachi bands. He’s not got much longer to live, although he seems to be as healthy as a horse; that’s just a terminal diagnosis we all receive when we are born. Lucky searches for the inexplicable truths behind the everyday words and common misconceptions of our world, until what he discovers approaches the enlightened. Not bad for an old Blue Grass boy come to the desert to while away his final years. It’s morbidly fitting that Stanton died as this film wrapped up; it sure seemed like a goodbye of sorts, or at least like a putting to words feelings that can only come when you begin to prepare for the end. What this film has to say about death shouldn’t be overlooked; it’s a fascinating and powerful message in its method of dealing with life basically being both a giant missed opportunity and an incredible ride. I like the perspective from which this story was told, it sat well with me, although I can’t speak for every audience. I can say that the cast was solid, a good mix of veterans and interesting faces that made the movie feel even more authentic: David Lynch, Ron Livingston, Ed Begley Jr, Tom Skerritt, a few others you’d recognize by face but not by name. Lucky is a short, sweet, surprisingly poetic glance at a single, fictitious person that somehow has volumes to say about humanity as a whole, and it’s an under-the-radar film that really ought to rise to where we can all appreciate it.